THIS has been advertised as a must-see fight that’s a must-win for both boxers. Manny Pacquiao, 40, returned to Las Vegas after two years and was welcomed like a reigning king. He was in plain attire, very calm, subdued, no body adornment whatsoever. Pacquiao is the regular WBA welterweight champion, but there’s the bigger WBA super crown belonging to Keith Thurman. Adrien Broner, 29, crownless, was quite fancy. He loomed and gleamed like a selfish ruler, richly garbed, wrists, fingers, neck and ears aflame with jewels. It was a study in all-revealing contrast. This happened during the arrival and presentation of the main fighters at the MGM Grand Las Vega. It’s no big wonder that Broner, the underdog who started grossly overweight, appearing loose and lost, is now being given a chance of snatching Pacquiao’s crown. Broner has the talent and ability, if not the discipline, to score an upset. Pacquiao is fully aware of that, the reason he has amazed plain fans and experts with his solid sharp form in training. Broner appeared composed at the start of the press conference. He however suddenly went wild and rained invectives left and right on Thursday. He slammed and slurred boxing analyst Al Bernstein and members of Team Pacquiao with profanities. To his amazed admirers, Pacquiao loved to explain he’s truly devoted to his craft and he draws power from his deep faith in God. Broner, who has never been stopped, could not say what pushes him on. 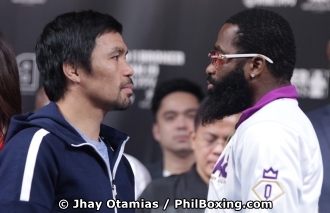 Instead, Broner obviously deluded said Pacquiao appeared nervous during the media face-off. “He don’t want to see me for real, what he does is try to smile his way out. He’s nervous, trembling,” Broner said. That’s not easy to believe. Pacquiao was clearly trying to keep hold of himself. He didn’t want to stoop low. Truth is that, although Broner was able to trim down rapidly, reality will present itself in the championship. He is scheduled to be softened with early body blows. Trainer Buboy Fernandez predicted a fourth-round end to the contest. Broner, who promises to be fully ready, might be needing nothing short of a miracle, to survive ferocious body bombardment. He should be at his proudest, bravest best during the moment of truth. His loudness, his fancy blazing decorations can’t save him He must, if there’s still time, be honest with himself. Click here to view a list of other articles written by Recah Trinidad.